We met up at the tube station, where there was a guy, writing entire stories and poems on the sidewalk with chalk. We both hadn't come to Camden market in a while, so we decided to walk up the main street, which is filled with all sorts of shops, selling all different things. It's the kind of place, where you can find gems among all the rubbish, and you're never sure what's just around the corner. It's bright, vibrant, and full of life, even on a Wednesday afternoon. Plus, we got lucky with the sun making it even more beautiful in pictures. Where else have you seen decorations like this on the front of pretty much every building and larger shop? We actually passed the market streets fairly quickly, for all its fascinating art and details. So we went on to explore some of the small, inner streets and tunnel markets that are the far end. Honestly, we had no clue where we were going, but we turned to whichever street or path seemed interesting. Along the way, a bunch of girls asked us if we can take photos of them, and naturally, we agreed. We even decided to go down and walk along the canal to see what we could find. Dissapointingly, it didn't lead to much, but I got a couple of cool shots anyway. I especially like the following image of the worker on the bike. The orange of his vest matches the cranes, creating an interesting visual parallel. It's a very cold-feeling image overall, and for me it shows the modern warrior, who is never appreciated. 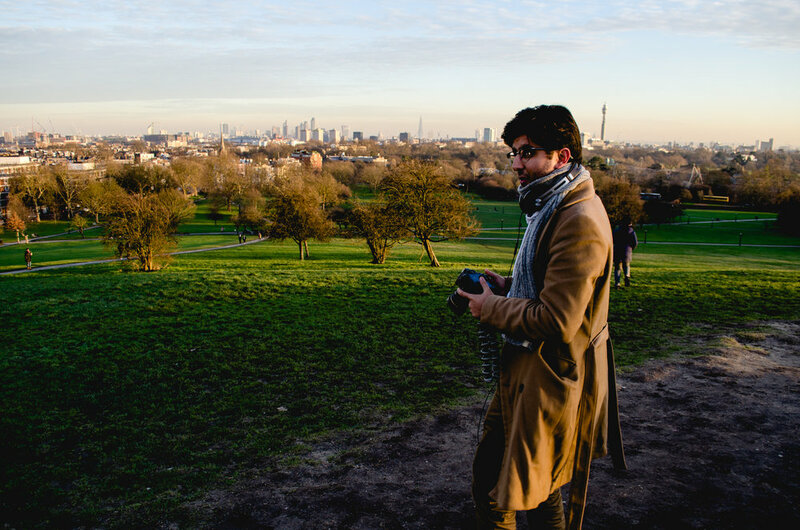 At that point, we were a bit short on ideas of where exactly we can head to next, but Danny suggested that we check out the nearby Primrose hill. 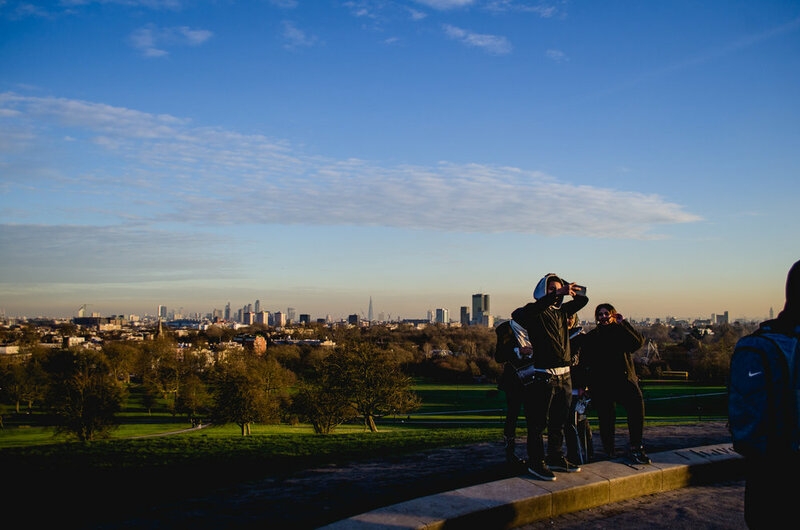 It's in the northern part of Regent's Park, and it's a popular spot, because of its amazing view of pretty much the entire London skyline.